Da da da da da da daaaaaah! There’s one week to go until our Strictly Charity fundraiser sponsored by Ryan’s. One by one, here are our lovely contestants who will be dancing for our chachacharity. Find out more about why they’re taking part and how to donate to them below. Alisdair has been paired with Debby and will be dancing the Waltz and the Cha Cha Cha on 9th July. With absolutely no dancing experience Alisdair is really taking on a challenge! Carol is dancing the Waltz and Jive with Eamon. She is taking part in Strictly Charity to challenge herself and with no dance experience at all felt that this could be fun, a good way to meet people and also support our charity at the same time. After catching the ‘jitterbug’ in previous dance classes Jacob jumped at the chance to take part in Strictly Charity. He will be dancing the Quickstep and Rumba with his dance partner Anna. Jeremy isn’t shy of a challenge, finishing his fourth marathon in Paris at the beginning of April. He will be strutting his stuff to the Quickstep and Jive with his dancing partner Niamh. Strictly Charity has been the perfect excuse for Jeremy to get his dancing shoes back on, with a little ballroom and Latin experience over the past few years which he couldn’t continue due to a lack of time. As MD of local charity Lapwing supporting young people, Jeremy says “Inspire works to make opportunities for young people. I understand just how important it is to begin life with support and opportunity.” We really appreciate the support and good luck on the night! “It’s time to see how good I can be or whether I’m just a dad dancer at heart!” says Jeremy. Kim has taken to the ‘Strictly Charity’ challenge with her dance partner John to dance the Tango and Cha Cha Cha. She told us “Learning to dance ‘properly’ feels like learning another language for me and I am working hard at it”. 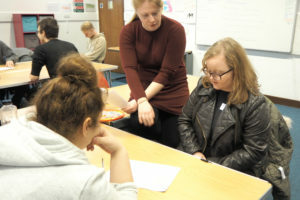 Each year Kim aims to support a charity and, watching Strictly Come Dancing with admiration for years, the idea of supporting a charity and taking up the challenge of doing it herself seemed like a fitting idea.  Giving up dancing as a child due to the ‘uncool’ heels, Leanne has begrudgingly strapped on her heels in support of Inspire Suffolk. Paired with the lovely Nigel, they will be dancing the Quickstep and Rumba. She is hoping to make her grandad proud who previously danced competitions at the famous Blackpool. He will be watching on the night and Leanne hopes that it will take him back to happy days gone by. Nicci is dancing with Gideon and will be dancing the Waltz and the Cha Cha Cha on the night. Having lived the dream of dancing through her daughter who has been a Co-op Junior for over five years, it is now Nicci’s turn to take to the floor. She has always wanted to dance but hasn’t had the chance to until now! Nicci works at Ryan’s who are kindly sponsoring the night for us. As a big fan of Strictly Come Dancing on the TV, Nick finally lived up to his promise to learn to dance properly and is dancing the Quickstep and Jive with his dance partner Izzi. 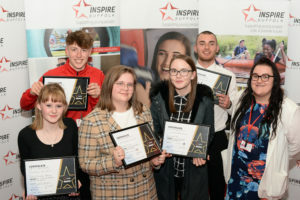 Nick works for OneLife Suffolk who have just moved into the Inspire Suffolk building and are kindly sponsoring Nick’s dancing efforts – thanks to OneLife for the support! Sadie will be dancing Waltz and Cha Cha Cha with Marcus. Catching Strictly fever from spotting the pictures from last year’s event, Sadie couldn’t resist taking part this year. Having always loved dancing, taking part in Ballroom and Latin lessons when she was younger, Sadie should be a dab hand on the dance floor. Myles is from Ipswich and works for Eaux Magazine. With zero dancing experience but the lust to learn how to dance, Myles is up for the challenge. 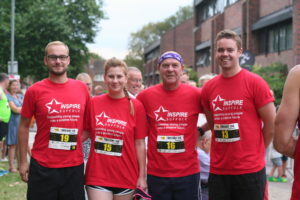 To sponsor Myles’s moves, please visit https://www.justgiving.com/fundraising/Myles-Davies! We would like to thank you all of the professional dancers from Ipswich School of Dancing for supporting our volunteers on their dancing journey.  Please dig deep to support our charity to help us continue to do the work that we do in Suffolk, every penny really does help.